We’ve all said those exact words. A painful memory we don’t want to dredge up. A journey we’re dreading. A place or activity that we sense as being dangerous. Or scary. Or just a little bit creepy. In the case of remembering the events of September 11, 2001 and the days following, many of us simply don’t want to go there. We’ve been there before—and we don’t want to go back. The images of the horror, the carnage, the twisted wasteland of Ground Zero remain seared in our memories. But we need to look at this devastating tragedy again. We need to remember. We need to go back—but not alone. We need to see the aftermath of 9-11 with the help of a trusted guide. And our guide is Chaplain Bob Ossler. I (Tim Shoemaker) first met Bob back in the early 70’s, so I’ve known him many years. Of all the people I’ve met in my life, Bob is not like any other person I know. He’s the king of going places and doing things that others dread, fear, or totally avoid. His career history backs that up. A Chicago paramedic . . . in the darkest, most volatile projects of the inner city, Bob served in areas so dangerous that he often wore a bulletproof vest when going out on rescue calls. More than once he was attacked by drug-crazed people living in the projects. 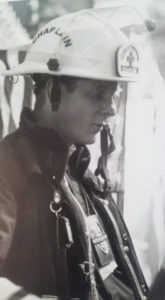 A Chicago firefighter . . . rushing into buildings as others ran out. A rescue diver . . . searching for victims in the ice cold, black waters of Lake Michigan while others stood on shore shivering. A chaplain and pastor . . . helping people wrestle free from the forces of darkness. I could go on and talk of other things Bob has done to help others, and tell you stories that would haunt you. He is one of the few men that I would trust with my life. If I were going into a scary or dangerous situation, I’d feel a whole lot better with Bob leading the way. Which is why Bob, in his book Triumph Over Terror, will lead you safely back to the days immediately following 9-11. 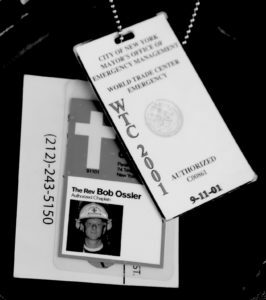 While so many of us watched the events in absolute shock and horror and fear, Bob raced to New York City to help. To do what he could do. And he didn’t just stay a day or two or three. Bob volunteered for five tours totaling forty-five days in that aftermath. Spielberg’s outdone himself. Crazy first thought? Yes, but . . . this was real life and real death, not a movie set. Somehow, viewing this 16-acre apocalyptic spectacle as a Hollywood set prevented the harsh reality of this tragedy from overwhelming me. Jumbled concrete chunks disarranged like the ruins of an ancient civilization; the fog of smoke and ash drifted over the trucks and volunteers; offensive odors assaulted my lungs. . . . I needed to keep my emotions in check to be effective in my work. And so I kept repeating the words in my mind: This is just a movie set. That statement jarred me to my inner core, scaring me witless. Our guide’s description was definitely not scripturally sound. Hell cannot be portrayed in Hollywood terms or set designs. But as I walked and viewed the destruction and mayhem fueled by ten violent, suicidal Islamic extremist terrorists, I grasped from a feeble human’s point of view what hell might look, smell, and even taste like. An overbearing stench—the incense of hell—wafted from the Pile. 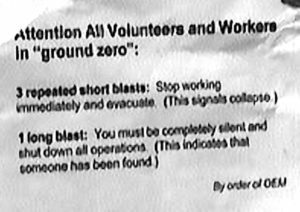 We walked onto “The Pile,”—the name rescue workers dubbed the mess at the center of Ground Zero. The top layers quivered beneath our feet. Heavy equipment worked to pull steel girders and beams free from the ruins. A constant reminder of the fragility of the debris stacked haphazardly beneath us, the shaking, rattling movement vibrated like an earthquake deep in the chasms and faults below. We stepped carefully around the crevices and gaping pits lest we lose our balance and plunge into the voids created by the collapsed Twin Towers. I never felt safe on that unstable pile. How did so much devastation happen in only 102 minutes? Our world will never be the same again. In 102 minutes the terrorist’s fait accompli destroyed the 16-acre World Trade Center complex. Arriving onsite at Ground Zero seven days after 9/11 proved to be gut-twisting, stomach-churning, and heart-wrenching. The televised images, however wretched, came nowhere near those firsthand smells, tastes, and sensations. Acrid smoke and toxic steam rose from fires raging underground. Putrefying bodies, few intact, remained trapped beneath the rubble. Choking, swirling dust and pulverized concrete mixed with DNA coated our tongues with grit. Hot metal seared through our thick-soled, leather work boots. Everything we touched—debris, trash, and yes, human bones, body parts, and pieces of flesh—fused themselves into memories that refused to leave. fear and trauma. Their stories, vivid in detail, sickened my stomach: men and women plummeting ninety stories to escape the burning jet fuel, heat and choking smoke, disintegrating on impact into flesh and exposed bone as they struck concrete sidewalks or the roof of the adjacent 22-story Marriott Hotel. I prayed for the brave individuals who witnessed the desperate jumpers. Hold them in Your arms, God, and comfort them. Shield their minds and hearts from the horror they’ve witnessed. First responders, police officers, firefighters, and paramedics, rushed into the scene to save people and to extinguish the fires. But how could firefighters control flames started by nearly 24,000 gallons of jet fuel? How could they fight a conflagration of hellish proportions, eighty-plus stories up in the sky, beyond the reach of the tallest hook-and-ladder fire trucks and the longest fire hoses? As I stood in horror, I thought of those terrorists who didn’t value the sacredness of life . . . who counted their success in dead bodies and mass murder. . . who believed violence to be acceptable to achieve their ends . . . who slaughtered several thousand people from all walks of life. The hideousness of senseless terrorism surpassed sane human thinking. This surreal, Spielberg-like scene really was a sliver of hell. In the midst of the shock, a whirlwind of questions reverberated through my heart: Will there be more attacks? How could this happen in our great country? As I stared at the piled remains of the WTC towers, I vowed to do my best to bring the love of Jesus here—and that vow, my friends, involved an enormous amount of prayer. Even now, years later, I shudder when I think about the Gates of Hell at Ground Zero. “I don’t want to go there.” I know. Nobody does. But you won’t go alone. In Triumph Over Terror, Bob will walk you through the wasteland and bring you out on the other side. That’s the kind of thing Bob does. Sometimes it takes someone who’s been through the smoke and rubble to help us see our life problems—and solutions—more clearly. I think you’ll be glad you took the journey. 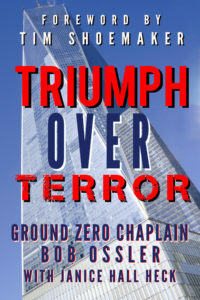 Triumph Over Terror chronicles daily events, people Bob met, and ultimately life lessons learned in those dark days following 9-11. But more than that, you’ll find hope. Healing. Perspective. Renewed strength and courage. And you’ll come away with critical life lessons to use as you show compassion and caring to those who suffer. This is a short excerpt from Triumph Over Terror, published in 2016 by Blackside Publishing. Both the Book and ebook are available on Amazon.